The Flames have two very solid forwards on their first line, with Sean Monahan centering Johnny Gaudreau. But what Calgary doesn’t have is a reliable right winger. Last year, Jiri Hudler had a career year, putting up 76 points in 78 games, and led Calgary in points. 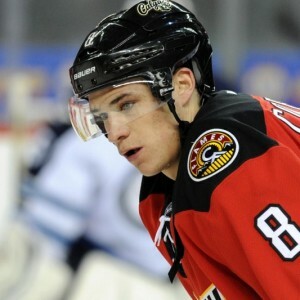 However, after the Flames became sellers at this year’s trade deadline, Hudler was shipped off to Florida, leaving the right-wing position on Calgary’s top line open. Coming off of two great seasons in Winnipeg, Michael Frolik signed a five-year deal with the Flames last July, making $4.3 million per season. Calgary has now desperately hurled Frolik with Gaudreau and Monahan, but unfortunately, Frolik hasn’t been unable to produce at the level a first-line player needs to. There shouldn’t be too much blame placed on Frolik, however — he has a very similar points per game to what he tallied with the Jets. Frolik has never put up points that would see him in a first-line position on most teams around the league, but he’s now been forced into the role. It’s a tough, unavoidable situation for the Flames, who also made the right move sending Hudler away at the deadline in order to prepare for the future, and are now left with a hole in their offence. 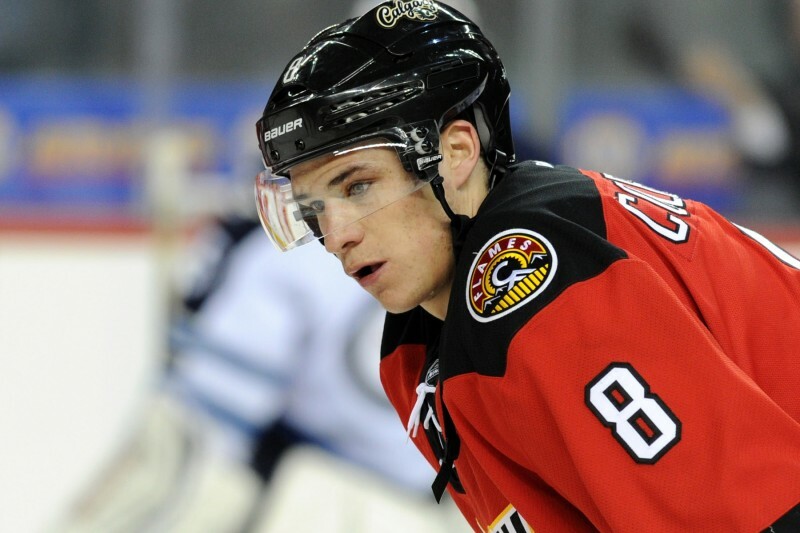 Calgary’s four right wingers as of now consist of Michael Frolik, Micheal Ferland, Josh Jooris and Joe Colborne. Garnet Hathaway has been playing on his off side at left wing, and is being replaced by Colborne, a natural centre. Both Frolik and Colborne are putting up solid numbers, each sitting with a ratio around a point per every two games. This is decent point production, and the two would make great second- and third-line wingers, but neither should be forced into a first-line role. Ferland and Jooris are simply filler forwards. Combined, the two players only have 21 points in 101 NHL games this season, and before moving up to the Flames’ main roster, neither were even producing near a point-per-game ratio in the minors. Ferland is only 23, while Jooris will be turning 26 this June, so to remain optimistic, they’re both still fairly young. But at best, these players would both only belong on a third or fourth line. Luckily for Calgary, the upcoming NHL draft seems to be the year of the winger. Adam Kimelman from NHL.com has four forwards ranked in the top-five spots for June’s draft, with two of them (Patrik Laine and Jesse Puljujärvi) being right-hand shots, and the rest (Auston Matthews and Matthew Tkachuk) also being able to play the wing. With Calgary likely to have a spot in the top-five selections, Flames fans will almost certainly see one of these four players at the Scotiabank Saddledome in the near future. The other option is free agency. If the Flames do let all of their UFAs go, they’ll have over $20 million to re-sign Gaudreau, Monahan, Jooris and Colborne, as well as sign another goaltender. There’s a chance that if they budget this money well, they could have a shot at picking up a high-end right winger in free agency. Some free agents that may not be outside of Calgary’s price range are Kyle Okposo or veteran P.A. Parenteau. Though filling the first-line right-wing role isn’t something that will be fixed this season, it should be a priority for Calgary in the offseason. Finding someone for Monahan and Gaudreau to play with could make or break the Flames next season, and could help to speed up the Flames’ rebuild.